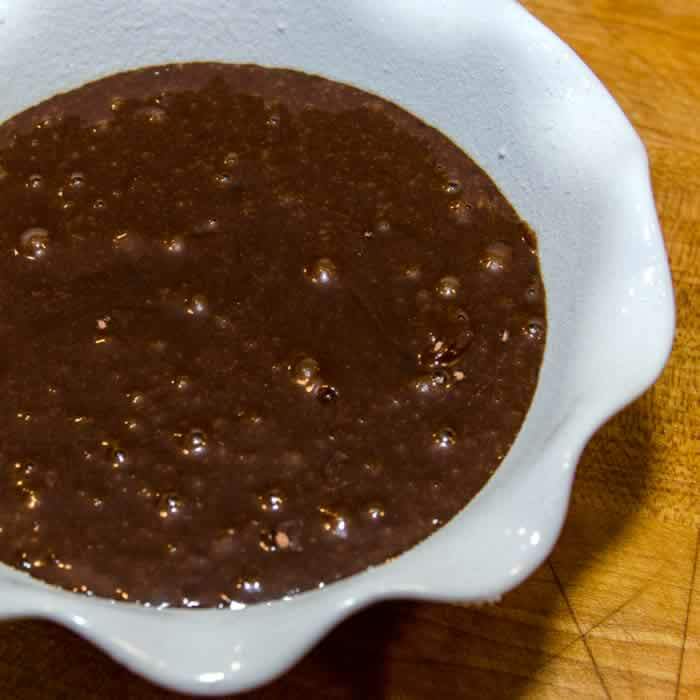 A no hassle, quirky, fun loving, tender hearted chocolate cake with a hot and spicy kick. Nothing says Valentine’s Day with quite the oomph of lush, spicy, bittersweet chocolate cake. Especially when topped with a fudgy bittersweet chocolate sauce. And embellished with jagged bits of caramelized bacon and peanuts. It’s a special cake, worthy of a special day. But that’s not all. You can make this unforgettable oil-based cake with two bowls and a spatula—in under 15 minutes (not counting bake time). No endless beating of butter and sugar. No careful incorporation of egg to avoid curdling the batter. No muss. No fuss. Just perfect results every time. In other words, a cake you can count on, a cake you can lean on, laugh with, play with, respect, trust, and admire. Love Cake. A no hassle, quirky, fun loving, tender hearted chocolate cake with a spicy kick. Oh wait, I just described MauiJim. He loves this cake. Make Ahead If well-wrapped to prevent moisture loss, this cake will keep at room temperature for several days; or longer in the freezer. Equipment Note If your baking dish is smaller than recommended, simply fill it half full with batter and use remaining batter to fill another baking dish half full. 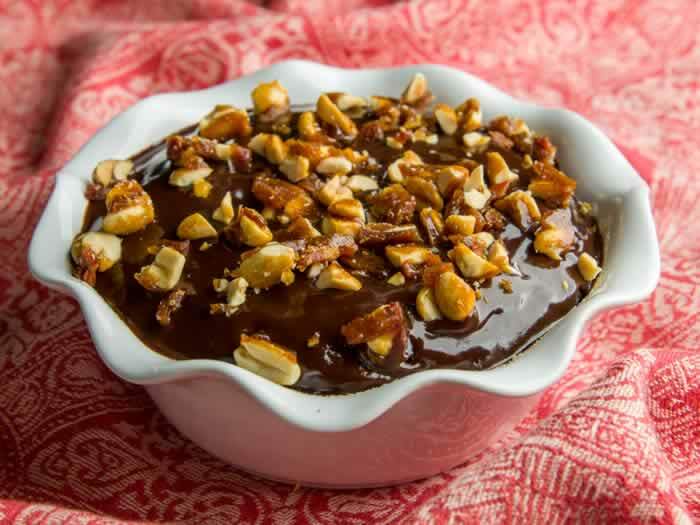 If you plan to take the Wild and Crazy route indicated in Step 12, make Bittersweet Chocolate Sauce and Caramelized Bacon & Peanuts up to a day ahead. Set rack in the middle of the oven, and heat to 350F°. Lightly coat a 3-cup capacity glass or terra cotta baking/serving dish with cooking spray. Sprinkle sugar into the dish and tip dish in all directions to coat evenly. Turn dish upside down and tap to remove any excess sugar that doesn’t cling. 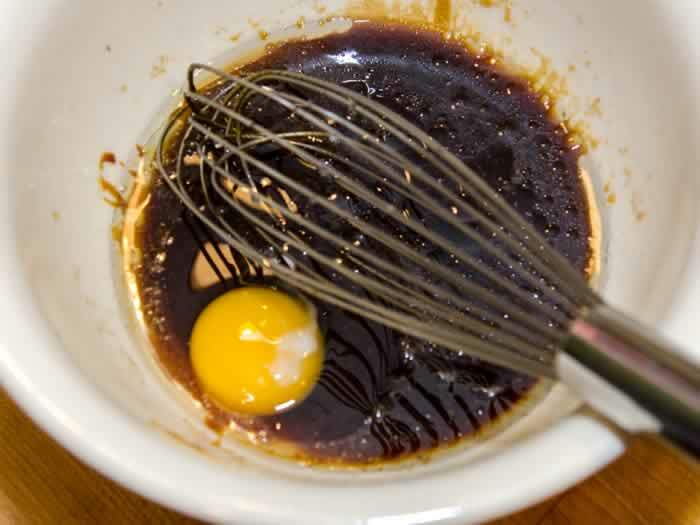 In a medium mixing bowl, whisk together the oil, sugar, brown sugar, egg yolks, molasses, coffee, and vanilla. Reserve. 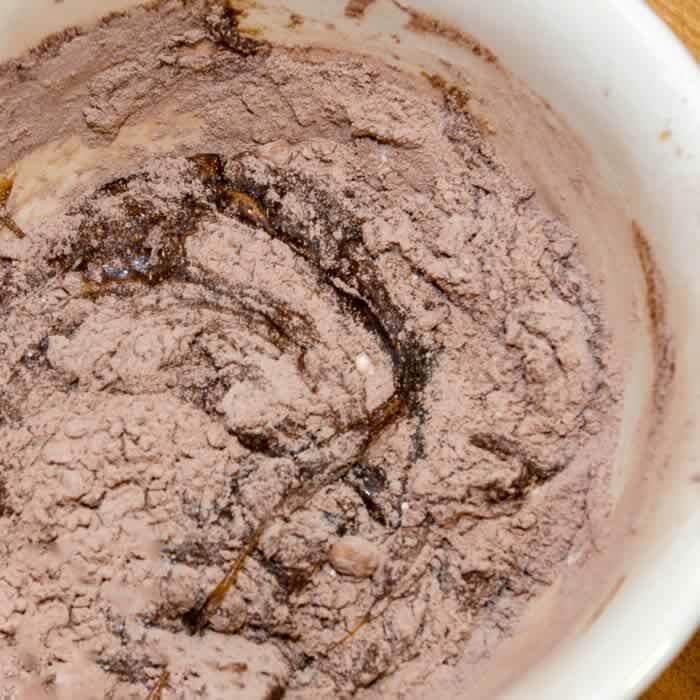 In a medium mixing bowl, whisk together flour, cocoa, ginger, cinnamon, chipotle, baking powder, baking soda, and salt. 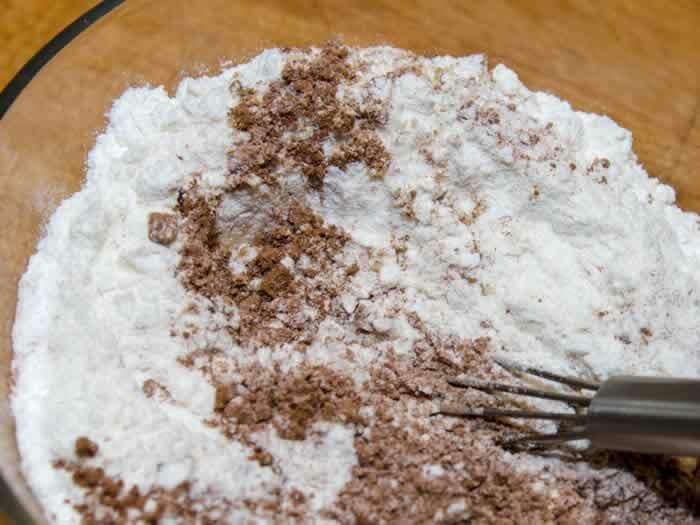 Add dry ingredients to wet ingredients, and mix until just combined. Over mixing will produce a tough cake. Pour batter into prepared baking dish, filling no more than half full. Pour any excess batter into another smaller baking dish. Bake the larger cake for 20-25 minutes (and the smaller cake for about 15 minutes), until the top feels springy and a toothpick inserted in the middle comes out with moist crumbs (not gooey batter). Remove cake from the oven BEFORE the edges begin to pull away from the sides of the pan. Over baking will produce a dry cake. Cool the cake in the pan on a wire rack for 15 minutes or so. To finish, simply dust with sifted powdered sugar. Copyright 2015-2019 Susan S. Bradley. All rights reserved. I love this cake–and I especially love the wild and crazy route lol! What a romantic and fun cake. 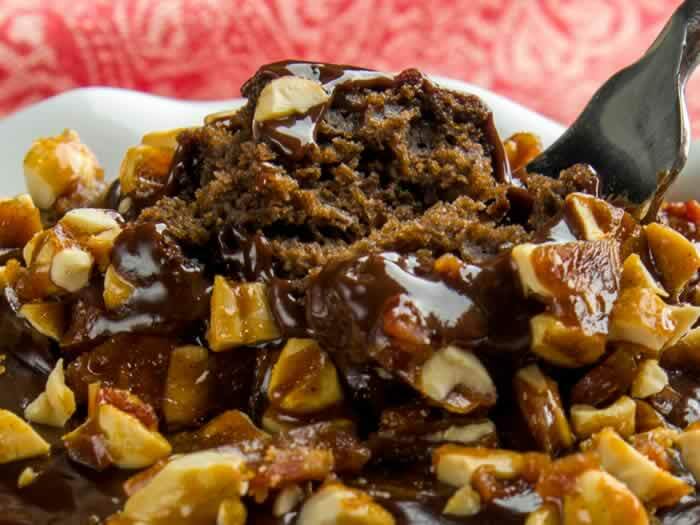 I love the idea of a small sweet – so much nicer for a quiet evening for 2 than digging into a major cake and having to put most of it in the freezer afterwards:) Topping it with carmelized bacon and peanuts is crazy – I’ll be dreaming about that embellishment tonight! What a fun (and delicious!) twist on chocolate cake! I am loving chocolate month! That little bit of chipotle chile….oh baby! Sounds like something I could devour! This sounds like my kind of baking! I am going to make this as a special treat for my husband! I’ll also have to top it with your spicy bacon-peanuts, which have been on my list to try. yum! Susan, I’m not going to lie here. I would make this for two..me and my stomach. The flavour combination sounds amazing! Thanks so much for sharing my Cherry Coke Cake! This love cake looks DELISH! !